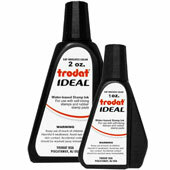 Ideal/Trodat Premium Stamp Pad Ink. Water based ink, can be used in all brands of self-inking stamps and stamp pads that use standard water based inks. Do not use in oil based self inking stamps.